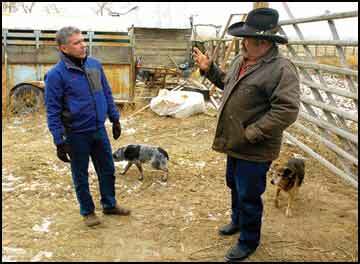 RONAN – From a Jeep, and out of about 50 head of bison in one pasture, rancher Bernard Hakes points out the 3-year-old heifer and three yearlings he purchased from the National Bison Range a week ago – bison that an opponent of tribal involvement at the refuge claimed had not been fed for a number of days. Hakes and another longtime volunteer at the annual bison roundup, Polson architect Paul Bishop, have come forward the week after the U.S. Fish and Wildlife Service abruptly ended its agreement with the Confederated Salish and Kootenai Tribes for shared management of the National Bison Range. Neither Hakes nor Bishop are tribal members, but they don’t think CSKT was given a fair shake at the refuge. Kallin was not available for comment Thursday, but deputy project leader Bill West vigorously defended him. Bishop says that while his exposure to the Bison Range is limited to two to three days a year when he volunteers at the roundup, he thinks it provides a good window into the work the tribes have done there since the co-management plan went into effect in the fall of 2005. Bishop, whose family has volunteered at the roundup for more than 20 years and who himself has been involved for more than 10, says that over time the bison became more savvy to the methods of FWS riders. It sometimes involved ramming the bison with the front bumper, Bishop says, and in 2004 – the last year FWS had sole control of the roundup – an adult bison was rammed from behind, its leg was broken, and it had to be killed. But when the tribes came on board, that changed, Bishop says. “The tribes’ first roundup was a huge success, which was completed in two days with time to spare,” Bishops says. Bishop says his jaw dropped when Kallin glossed over the success of the roundup afterward. West says the Fish and Wildlife Service has always praised the tribes’ work at the annual roundup, and it was other areas over the course of the past year where work was done less than satisfactorily or not performed – much of which was documented in a critical (and controversial) performance report. He credited FWS biologist Lee Jones with discontinuing use of a Jeep to herd bison into corrals, as well as developing the system that allows roundup workers to pass a wand over implanted computer chips in the scale area to get information on each animal, without driving them into a squeeze chute. And, he says, she’s also responsible for the use of hydraulic squeeze chutes at the roundup that are easier on the animals that are directed there than the old chutes were. But Bishop says the biologist was “particularly agitated” at the roundup. West says the tribes made it clear from the beginning that “they wanted credit for the jobs they did, and didn’t want us to do their jobs.” The tribes, he adds, do deserve credit in other areas at the roundup. Hakes says he employs similar tactics on his ranch, using what he calls “Judas cows” to move the bison where he needs to. The Fish and Wildlife Service, he says, is simply protecting its turf from the tribes, who had been in negotiations with the Department of Interior to take over full control of management at the Bison Range when the plug was pulled on the Annual Funding Agreement that allowed for the co-management plan.